A lawsuit alleging inhumane treatment of detainees at U.S. Border Patrol stations in Arizona will move forward thanks to a ruling on Monday by a federal judge in Tucson. 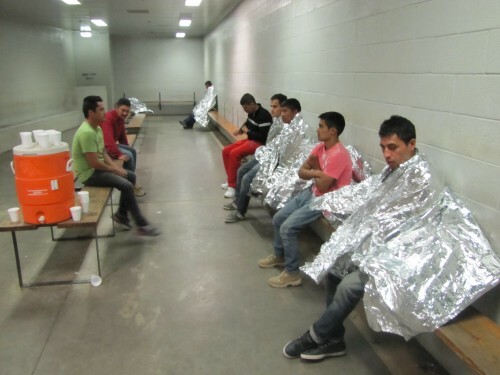 People detained by the Border Patrol in Arizona nicknamed the holding cells where they’re initially processed “hieleras,” or ice boxes, describing the frigid temperatures inside. In June, a coalition of immigrant rights organizations, including the National Immigration Justice Center and the American Civil Liberties Union of Arizona, sued the Department of Homeland Security (DHS) saying that its detention practices at eight Arizona Border Patrol stations violate the constitution by intentionally punishing people involved in a civil procedure. Detainees allege they are forced to sleep on concrete floors and denied adequate medical care among other complaints. DHS disputed those claims and asked the court to throw out the case. On Monday, federal district Judge David C. Bury denied the government’s request. He also ruled the case to be a class action lawsuit, allowing the possibility for more plaintiffs to join. According to government data, the eight Arizona Border Patrol stations within the Tucson sector detain tens of thousands of people annually. This entry was posted in KRTS News and tagged Arizona, Border, Border Patrol, Border Policy, Detention Centers, Fronteras Desk, Immigration. Bookmark the permalink.